Stan and Jan Berenstain launched the Berenstain Bears books in 1962 with The Big Honey Hunt. Since that time, more than 365 Berenstain Bears books have been published, making it one of the best-selling children's series ever. Today, Mike Berenstain continues his parents' tradition of creating warm and engaging stories featuring the lovable Bear family. 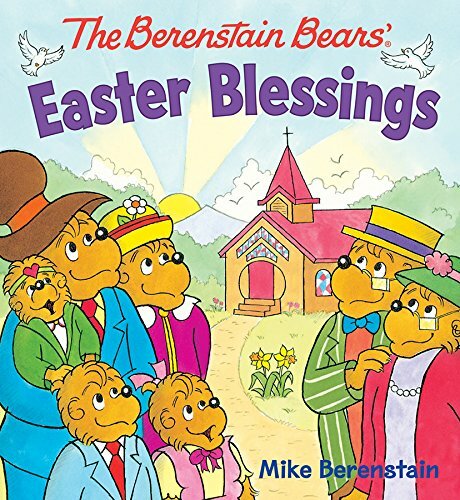 In The Berenstain Bears' Easter Blessings, the cubs learn about the many blessings in their lives, and especially the greatest blessing of all-the Resurrection of Jesus on Easter. The short, simple story and well-loved characters provide toddlers with a perfect introduction to this very important Christian holiday. The Berenstain Bears are a perennial classic. Just about every child over the last couple of generations has had a Berenstain Bear book read to them. It is no wonder as they have beautiful, colorful drawings with fun characters and a sweet yet simple moral. They are wonderful stories for toddlers. The Berenstain Bears’ Easter Blessings is filled with all of those qualities. In The Berenstain Bears’ Easter Blessings our little cuties are encouraged to put first things first. To understand that candy and eggs come after the celebration of the reason for Easter worship. Most importantly, at the end of the story Preacher Brown shares the greatest blessing. Sweet and simple… perfect for a toddler. My good friend Elli, who blogs at What's up in Scrivnerburg posted a review on The Berenstain Bears’ Easter Blessings. Please go and look at what she has to say about the story.